In last week’s post I mentioned the Fermented Pineapple and Chilli Sambal I had made from a recipe published in the book from the Sydney cafe “Cornersmith.” I’ve always been a keen pickle and jam maker so my pantry cupboards are generally well stocked with delicious preserves. Our tastes are changing though, we want to eat less sugar and we prefer the flavour of the fruit or vegetable component to shine through, not be masked by vinegar and spice. I was keen to experiment. Other than making sourdough and yoghurt my experience with fermentation was limited. Australia as a whole has embraced the flavours of Asian and other warm climates and so it’s only natural that preserves our evolve as well. This recipe for Sri Lankan style Fermented Pineapple and Chilli Sambal jumped off the page at me the first time I flicked through the “Cornersmith” cookbook. Organised by seasons there’s a long list of interesting flavour combinations and ideas for jams and pickles waiting for me to experiment with. Pineapples are local, plentiful and cheap right now. Just one pineapple made a 1 litre jar of sambal. I followed the instructions accurately although reading about fermentation led me to assume that given the temperature in Brisbane the jar would be bubbling away after a couple of days. At the end of Day 2 there was next to no action, day 3 was a similar story then when I got up on the morning of Day 4 the lid had blown slightly, and the juices were spilling out. Fermentation was in full swing. After another week in the fridge I had a seriously delicious hot, sweet, salty, aromatic acidic pickle, totally different to the condiments I’m accustomed to. The flavour is fresh and addictive and leaves a wonderful zing on the palate. I tried using the sambal with a few different dishes, but by far the best so far has been to use it as a dressing for my Asian Style coleslaw. I added 1 full cup of drained fermented chilli and pineapple sambal to the vegetables and simply dressed it with the juice of 1 large lime and a grating of palm sugar. I think I have created a new and indispensible ingredient. Wash and sterilise a 1 litre jar with a screw top lid. Cut the skin from the pineapple then use a parring knife to cut out the eyes. Cut the pineapple into 2cm thick slices then into 2cm chunks. In a non reactive bowl combine all the ingredients. Massage the pineapple chunks until they collapse and release their juice. Spoon the pineapple into the jar pushing down the fruit so it is submerged under the brined juice. Screw the lid in place. Put the jar on a saucer to catch any spillage then leave the jar on the bench until it begins to ferment. The lid will pop up and the juices percolate out. This will take 2-4 days depending on the temperature in your kitchen. Transfer the jar to the fridge and leave for 1 week before opening. Serve as an accompaniment to spicy food. Intriguing! Had never occured to me to ferment pineapple. Oh my goodness this sounds fabulous! How interesting! Sounds very delicious. I really love the thought of this recipe! Pineapples are not common her in Greece, though I can get them (at a cost and also not of a predictable quality). The temperatures here in the autumn are perfect for fermentation and the flavours sound perfect, so I may try to find a decent pineapple. Both yours and Ardys’ comments are useful here. Her GF sourdough starter sounds very interesting. I agree, she should post on it! This is a very timely post for me, Sandra. I have embarked on a gluten free sourdough starter based on pineapple juice and brown rice flour. The fermentation seems to be taking a bit longer than the recipe said it would. I read your post yesterday afternoon and didn’t despair when there were still no bubbles after the second stage of fermentation, but this morning, there were bubbles. My kitchen is a bit warmer than normal, as you can imagine with 39-40C days we are having. I read an article about fermentation and it says that it does best in 21-24C temps. Mine is a bit warmer than that so I’m thinking just because the room is warmer doesn’t mean the fermentation will happen faster, or at all. Apparently warmer temps often causes mould. I had success fermenting brined vegetables which I’m getting ready to post on, too. That was in winter, very much cooler temps. This fermented pineapple looks delicious and I will definitely be trying it. Thank you! Interesting comments Ardys. I’m new to this so it was trial and error for me. My kitchen was probably around 20C when I started the sambal. The fermetation seemed to get more active after I transferred the jar to the fridge. I remember attempting sourdough starters that just went mouldy and blamed my cool Melbourne winter kitchen but the comments on this post make me think there is more to this than meets the eye. I have read light can be an issue too. Good luck with the GF sourdough starter, I know a few people who’ll be really interested if you can make it work. That pickle screams ‘Queensland’. The notion of pineapples being cheap and plentiful remind me of lovely drives around Mission Beach, stopping at roadside stalls to load up on tropical produce. This is a lovely pickle for summer- nice beside some charcoal grilled fish. I’ve had absolutely no luck with fermentation. I tried for a yummy sounding red cabbage, apple and capsicum mix, but it just sat there being sad, and is still there, doing nothing, 6 months later, despite the temperature in my kitchen being well above the average room temp. I think the bugs know that I’m deeply dubious about fermented foods, which all taste spoiled to me, and they’re punishing me! The Husband loves pineapple and chilli, so I may need to make one more attempt. Oh that’s bad luck Kate. This worked first pop and is really good. I’ve decided to give it a go, hopefully next week after we get back from 4 days away. Good luck, love to hear how it goes..
You can ferment in any weather! Just keep your jar at room temperature inside your house, and wait a little longer. I make sauerkraut and various other fermented vegetables throughout the winter, and have no difficulties making it live and bubble away, it just takes a bit longer. You won’t even need to refrigerate your jar to stop the fermentation process, as it will be slow enough. Wow, thanks for the tip Darya. Now I am going to find a nice ripe pineapple. You gave me hope. Thank you. This is fantastic. 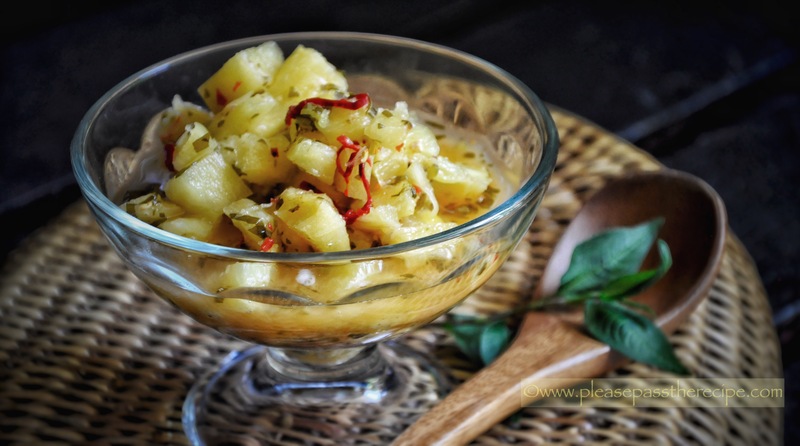 I love fermenting but had no idea you could create such a wonderful condiment with pineapple. Sounds delicious! This entry was posted on November 10, 2016 by ladyredspecs in Cooking, Dairy Free, FODMAP diet, Food, Gluten Free, Pickles & Chutneys, Preserves, recipes, Side Dishes & Salads and tagged cooking, ferment, fermented pineapple chilli sambal, Fodmap, gluten free, pickle, pineapple, recipes.